Kate and I want to thank all of our customers, students and friends for joining us at the farm and helping make the summers of 2010-2017 absolutely wonderful. With Kate returning to England, Andrew and I will be taking over the management. I want to thank Kate for her years of service and love for the animals. Dear Karin, Thank you so much for an amazing summer! You have helped Sunset and I so much and I cannot thank you enough. You have cared so much about us and our horses and have been patient with me and also Sunset with his self./ I can’t wait until next summer and until then we will send you updates…..
Dear Karin, Thank you so much for the wonderful Progressive II three day weekend of lessons and learning September 24-26th. It was fabulous. Whether I was riding or auditing I truly learned so much. I loved how you broke things down to basic elements and then had us work on each one. I have taken several clinics over the years and I must say that the way you teach and explain your system not only makes so much sense but also the way you communicate that to the rider is easy to understand. I don’t know what I expected, but with all your accomplishments you are so down to earth, and the joy you get from your work is so apparent and contagious!! I felt like a sponge and wanted more. appealed to a cross section of riders in the local community. Personally, Karin has trained me in various riding disciplines. Also, I was able to indulge my passion in riding with a like minded individual. A friendship blossomed. Karin is a kind, generous, and devoted friend. In summary, I highly recommend Karin and Brek-n-Ridge Farm for any endeavor you may seek to pursue. She will be a valuable asset to any organization or family. I am so happy as your neighbor,to see lovely horses in the fields and so much activity around your stable. It has been such a pleasure to get to know you, your stable and the kind and friendly staff. I must thank you for all your patience in teaching a senior citizen of my caliber, not only to ride, but care for the sweet horse a wee bit. The entire experience has been awesome. I am so grateful to you for the excellent training experience I had with you recently. I thoroughly enjoyed your approach of training, through working with and understanding the horse’s natural tendencies. Your kindness and gentle direction toward both horse and rider were amazing and so helpful in my continued quest towards achievement in dressage. You definitely helped me focus my perspective on these wonderful animals while keeping both the horse and I safe, safe, safe! But most importantly, you kept the joy in the ride, which is so important to me as an adult beginner! I am so looking forward to practicing the various techniques I’ve learned from you. I am certain over time and with persistence, my progress in Dressage will be advanced due to your instruction. I look forward to my next training experience with you and being able to proudly show you my progress towards excellence! Stewart and I are such a better team since we started working with you. I have learned so many new things. I swear, when I work with you for an hour after school, I learn more than in seven hours at school. Thank you very much for every thing you’ve taught me. I can’t wait to see where we will be next year! I just wanted to thank you for all your help over the summer and bring you up to date on our progress since we left your farm at the end September. We were all so thankful to escape the unbearable Florida heat and rain and to enjoy the beautiful Michigan summer in your gorgeous facility. We all (horses included) needed some productive “time away” from a very stressful and demanding winter season. I appreciate you sharing your expertise with us while developing all three horses. The exceptional care and training we had over the summer allowed the girls to step back into the hunter/equitation program without missing a beat. I appreciate your exceptional attention to every detail for the horses from the moment they stepped off the trailer. You and your team were certainly equipped to handle all aspects of a rehabilitation program from hand walking, to regular schooling rides, and to working with my oldest daughter to make sure she was able to keep the mare on track. You went out of your way to find another horse for her to ride, and we appreciate you making special accommodations for that. Minnie and my youngest daughter certainly returned to Florida as the “most improved”. After six months away from the competitive arena, she had an opportunity to show Minnie this weekend at the SFHJA Charity Show and showed amazing improvements. In spite of nervousness and some bad weather, she placed in every class over fences finishing 1, 5, 7, and 8 and placing 3rd in the under saddle portion. The ribbons are less relevant than the improvements in her confidence and riding ability. 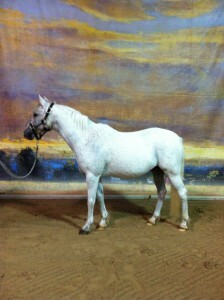 She is definitely a better horse person and a more confident rider for having spent time with you at Brek-n-Ridge Farm. I know there were many who were skeptical about us leaving South Florida to spend a summer in Michigan at a dressage barn of all places! It proved to be an invaluable experience for all of us. It’s obvious that you’ve poured your heart and soul into this amazing farm and your passion for the horses evident in everything you do. The techniques that we learned over the summer have not been forgotten. We all continue to work on getting the horses to use their hindquarters, and it has been fun to watch the girls as they notice the subtle differences in how other horses are ridden while being schooled for the ring. The virtually invisible halting technique is still working for us as we continue to work to have them halt and stand in perfect form. We continue to work on improving transitions. Please give our best to Kate and Andrew. Dear Karin and Kate, Thank you so much for providing the wonderful opportunity for Abby and Anna to learn about horses and riding. Your partnership with the YMCA has enabled us to get involved in a sport we might otherwise not have been able to. Not only is Brek-n-Ridge Farm a stunningly beautiful property and stable, but I can’t express enough how impressed I’ve been with how you interact with my girls. From the beginning you honed in on each girls personality and have connected with each so gracefully. I have come to appreciate that riding is more than the word alone implies. 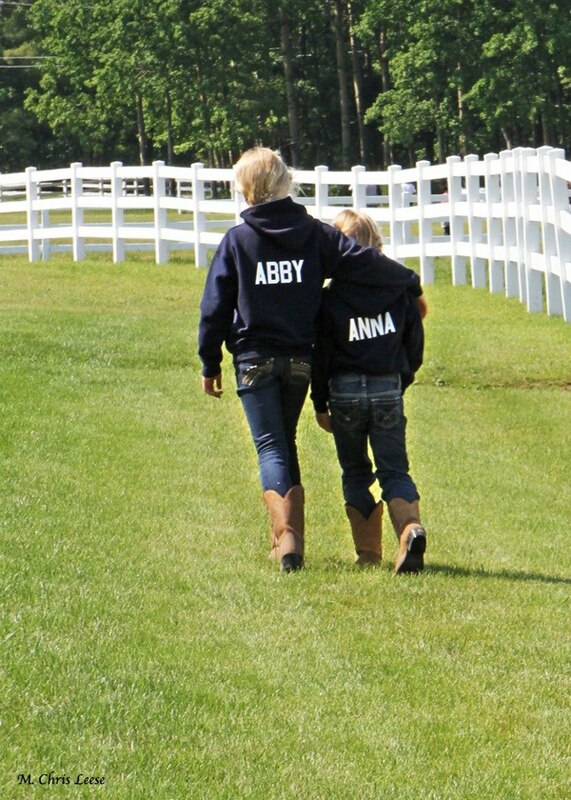 You have taught Anna and Abby more about confidence, poise, communication and respect. I especially thank you for that ! We look forward to continuing lessons with you and wouldn’t hesitate to recommend you to anyone. My kids learned from you. And I must confess…I learned from you. You are a true professional but more than that, you care so deeply about what you do that it comes through in every aspect of the experience that me, our pony “Ice Man”, and my kids had at Brek-N-Ridge Farm. And when I say that I learned from you…I don’t just mean that I learned some things about how to care for horses or how to ride a horse but something more high level and global – that is – how to be a true professional; how to provide extreme customer service; and how to deliver value to your customers that goes way beyond just getting “over the bar”. I’m so impressed Karin. I’m so thrilled with our experience. Thank you. Thank you for everything Karin…. And you can be sure we will follow your prescribed course of action for how we care for “Ice Man” going forward…. Mary has been riding 6 days a week since she started leasing a little pony, Noel. We started the lease the middle of November and went to two shows the first two weekends of December. She rode again in a January show the weekend we returned from Christmas holidays. It was the first time she had competed in regular pony hunter, not children’s. It was a good challenge for her since the course was different from what she was used to and the jumps were 3″ higher. She also competed in beginner ponies and she got a first place in equitation. Noel is an energetic pony, similar to Annie, and although he has some issues with speed and straightness over jumps, Mary is really beginning to learn how to control him. She has been practicing a lot using all of the dressage techniques she learned from you last summer, and they have made the biggest difference in the way she is able to handle this pony. Your instruction has been priceless and has given Mary so much confidence. Everyone at the barn is so impressed with how well she is riding Noel. I wanted to check in about this summer. We had talked about leasing Annie and I did not know if that still worked. Mary is excited to ride with you again. Mary would love to do a work study also for a few days if that works. Whatever you are doing, would be great! Mary and I read your educational piece on www.lingh.nl . It was very informative and has Mary really excited to learn more. I hope you have been having a good winter. It sounds like there has been a lot of snow. Say hi to Kate and Andrew. Where to begin …several months ago, after a few lessons, you asked me if ” a horse was in my future?” to which I replied ‘in a year or two” – well here we are – hooked! ( Hook ,line and sinker!) – I have learned so much in the short timethat I have known you – I have learned how to walk a horse and how not to walk a horse – how to get on a horse and not get on a horse – how to pick sawdust from the tail – or more appropriately ‘how not to’ and SO MUCH MORE! I am very grateful. I appreciate your style of teaching and admire your profound knowledge of the sport. I can’t begin to thank you for making the purchase of Matisse happen – you truly went ABOVE AND BEYOND! We are so excited to learn from the BEST! Thank you for allowing us to become a part of your barn – we feel very honored! Thank you so much for the helpful lessons, and friendly learning environment. Riding with you has greatly improved my riding and training abilities. I have been able to apply what I have learned to other horses no matter what discipline they have been trained for. Your horses are some of the best, and make learning a fun challenge for students of all ages. My favorite is Starburst, an experienced lesson horse who still has some things to teach me , even after 14 years of riding. Starburst has taken me over fences, through dressage patterns, and on trail rides, she is a wonderful teacher ! Trainer and instructor Kate Etherly has helped me discover small mistakes in my riding that, once corrected, make a huge improvement. Her unique explanations and demonstarations have greatly improved my riding abilities. Thank you Karin Offield for the opportunity to ride on your wonderful farm. After meeting Karin Offield at ‘Dressage by the Bay’ in Traverse City, I knew that she was the trainer for me. Her keen eye helped me evaluate my position and make the necessary corrections for a more effective seat. Her training concepts were very logical and in line with how I believe a horse should be trained. A few weeks later, I decided to do a 4 day clinic with Karin and we did 5 private lessons. These lessons varied in length, intensity and instruction according to what she felt my horse and I needed. I was very impressed with the one-on-one instruction I received and Karin helped me develop a system that would work for both my horse and me, once we returned home. I really appreciated her thoroughness and consistency in training. Her instruction was clear and uplifting and when I struggled to fully understand something, she had all the patience in the world. I am happy to report that the system Karin helped me develop has worked! My horse is the same at home as he was at her facility, Brek-n-Ridge Farm, and although I know we will still have bumps in the road, I am much more confident knowing that we are on the right track! A concept that was ingrained in me throughout my training with Karin, is the fact that I am the only consistent factor in my relationship with my horse. This pertained to my position, my attitude, the application of my aids and even regarding the care of my horse. Horses are attracted to leadership and blossom under consistently productive handling. I look forward to many years of training and clinics with Karin Offield here in Michigan at her barn, Brek-n-Ridge Farm in Harbor Springs, Michigan and at my own Serenity Farm in Grand Rapids, Michigan. Recently, my husband gave the green light for me to buy a dressage schoolmaster. I was thrilled beyond belief. How many women could be that fortunate? My trainer, Karin Reid Offield, was very happy for me. The difference between a pro like Karin; however, and the little amateur me, is that I was thinking with my heart and Karin was thinking with her head. Having bought and sold many horses in her lifetime, including the fabulous wonder boy Lingh, Karin knew it would take a while to find the right horse for me. I announced that I was going to Wellington, Florida for the month of February in search of my horse. I think Karin was nervous that I would traipse off and buy the first horse that flashed its big brown eyes at me. Now, came the time when a wise, dedicated trainer stepped in. Even though Karin was leaving for Europe on business, and to visit Lingh, she immediately said, “I’ll meet you in Wellington the first week of February and fly in directly from Germany.” I couldn’t believe my ears. How many trainers would do that for a student? Karin began a fast and furious month of contacting professionals she knew and trusted in the Wellington area and we were off and running. When Karin arrived in Wellington, she called me immediately and said, “Have you got your riding clothes ready?” I hesitantly said, yes and her response was “Great, because I’ll meet you at the Tackeria at 8:00 a.m. sharp tomorrow. We will be riding and trying horses all day.” That turned out to be only the first of many days of riding beautiful, highly trained dressage horses. As we visited each stable, Karin would tell me the background of each horse. The other trainer or owner would ride the horse first so we could both watch it move. Then Karin would ride the horse, all the while talking to me and telling me what she was feeling. When it was my turn to ride the horse, Karin gave me a sense of confidence and also little hints as to getting the most out of the horse. When we left each farm, we took notes as to the positives and negatives of each horse. Karin , early on in the game realized that no matter how wonderful a horse was, it had to pull resoundingly at my heartstrings. Throughout the entire process Karin encouraged me and was very positive. No matter how many horses we tried (and we tried quite a few) neither she nor I was discouraged. I secretly had a feeling that the right horse would be in Florida. One day Karin announced that someone was bringing an Intermediare I Schoolmaster down from Northern Florida for us to try. When I first saw Rising Sun I knew she was something special – and so did Karin. After riding the beautiful mare for two days we both did a high five and smiled and laughed the rest of the day. This was the easiest horse transaction I have ever undertaken – thanks to Karin and also to Kate Etherly. The vetting was set up by one of the top equine vets in the country, Brendan Furlong, all the way from New Jersey. Karin and her staff followed up with all testing and x-rays. I never had to worry about shipping – all was taken care of for me. Throughout this whole procedure, Karin really cared about me. She wanted to keep me safe and find a horse who could help complete my dreams. With Karin, I have not just a trainer – I have a true friend. I must also say thank you to a wonderful woman and former owner of Rising Sun, who was sweet, honest and truly in love with her mare. Thank you for parting with the girl who now has won my heart. I wish you well as you continue your travels in the world of dressage, Nancy Hutson. You obviously loved this tremendous mare very much as it shows in her loving nature. A big thank you to Mary Ann Grant and Carol Grant for helping so much in Wellington and a big hug and laugh to Marcel for all of our fun antics. Again, Kate and I want to thank all of our customers, students and friends for joining us at the farm and helping make the summers of 2010-2015 absolutely wonderful.